Several special routes of U.S. Route 52 exist, from North Dakota to South Carolina. In order from northwest to southeast, separated by type, they are as follows. US 52's Welch Alternate route follows the original path of US 52 through town prior to construction of the Welch bypass around 1950. The route follows West Virginia Route 16 along with portions of Virginia Avenue and other streets. U.S. Route 52 Business is a 2-mile-long (3.2 km) business route of U.S. Route 52 in Harvey, North Dakota. It runs from U.S. Route 52 in Harvey to U.S. Route 52/North Dakota Highway 3. U.S. Route 52 Business is a special business route of U.S. Route 52 in Ironton, Ohio. U.S. Route 52 Business exits the mainline route at the village of Coal Grove, just south of Ironton then follows the original pre-1962 routing of U.S. 52 through the central business district of Ironton before rejoining the mainline near Hanging Rock. U.S. 52 mainline was moved to its current alignment in 1962, which is a controlled-access 4-lane highway which bypasses the city itself. The business route was established at that time but was poorly signed for many years until 1999 when an effort to improve signage was completed. Since then it has been sufficiently signed as U.S. Route 52 Business. U.S. Route 52 Business was established in 1960, a renumbering of US 52A through downtown Mount Airy, via Main Street, Renfro Street, and Lebanon Street. Between 1963–1967, US 52 Business was split on one-way streets: northbound via Cherry and Renfro Streets, southbound via Main Street. Sometime between 1969–1972, southbound US 52 Business was removed from Main and Cherry Streets, and moved onto an extended Renfro Street. U.S. Route 52 Business was established in the mid-1990s, it goes through downtown Albemarle, via First Street. U.S. Route 52 Spur is an unsigned 2.98-mile (4.80 km) long spur of U.S. Route 52 in Charleston, South Carolina. It extends from U.S. Route 52 (where it is named Meeting Street) to Broad Street along the northeastern side of the peninsula of downtown Charleston. 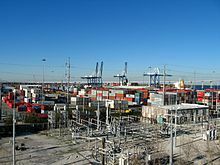 The route provides access for trucks to shipping terminals of the port on the Charleston peninsula: Union Pier and Columbus Street. The entire route is in the city of Charleston. 1.29 miles (2.08 km) of the route is named Morrison Drive and the remaining 1.69 miles (2.72 km) is named East Bay Street. One section of the route, Morrison Drive near Jackson Street, will flood regularly during a spring tide. The eastern terminus is near the historic wharves of Charleston, including Adgers Wharf, which is now the site of a playground. It is also adjacent to the old Exchange, or Customs House, of Charleston. The current Customs House that was built around the time of the Civil War is on this route. The section named Morrison Drive was constructed in the early 1950s. It was named for William McG. Morrison, mayor of Charleston from 1953 to 1954. When Morrison Drive was constructed, there was still one private terminal operating near the Eastern terminus, the Clydeline Steamship Company. The Clydeline terminal burned down in 1955. In the late 80s, the land of the terminal was rebuilt as Charleston Waterfront Park. U.S. Highway 52 Alternate (US 52 Alt.) existed in northeastern Iowa in the 1960s. The original pavement on US 52 between Dubuque and Luxemburg was in such poor condition that the Iowa State Highway Commission rerouted the highway along US 20 and Iowa Highway 136 and the alternate route was established along the old route. Once comprehensive repairs were made to the roadway, the mainline designation was restored to the routing. U.S. Route 52A was established in 1953, replacing the old mainline US 52 through downtown Mount Airy, via Main Street. It was renumbered in 1960 as US 52 Business. U.S. Route 52A was established in 1949, replacing the old mainline US 52 through Pilot Mountain, via Main Street. It was renumbered in 1960 as US 52 Business. U.S. Route 52 Business was established in 1960, a renumbering of US 52A through Pilot Mountain, via Main Street. It was decommissioned in 1964 when the Pilot Mountain Parkway was opened, taking US 52 onto a new alignment west of town. ^ West Virginia Department of Transportation (2003). Welch (PDF) (Map). ^ Google (2011-03-05). "US 52 Bus – Mount Airy" (Map). Google Maps. Google. Retrieved 2011-03-05. ^ a b c "NCRoads.com: U.S. 52 Business". Archived from the original on 2010-11-25. Retrieved 2011-03-05. ^ Google (2011-03-05). "US 52 Bus – Albemarle" (Map). Google Maps. Google. Retrieved 2011-03-05. ^ a b "NCRoads.com: U.S. 52-A". Archived from the original on 2010-11-25. Retrieved 2011-03-05. This page was last edited on 5 April 2019, at 01:12 (UTC).